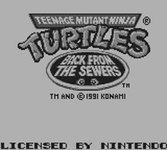 Similar to Fall of the Foot Clan, the previous Game Boy game in the series, the player can switch between turtles before each stage. Each turtle has his own strengths and weaknesses. Donatello has a long range of attack, but attacks slowly, Raphael's attack is fast but has a very short range, and Leonardo and Michelangelo are well-balanced. When a turtle is defeated, he becomes captured by the enemy. The game is over when all turtles are captured. After completing a stage, the player is given the opportunity to rescue a captured turtle. If no turtles were captured, the player enters a bonus stage instead. The game features several gameplay elements besides the typical beat-em-ups like dodging huge boulders in the underground levels, going around on skateboards or scaling air lifts, and the game also shifts from being typical 2D just walking left and right to a more open area where the turtles can walk all over the screen. The bosses of the game are the standard villains: Bebop, Rocksteady, Baxter Stockman, General Traag, Granitor, Krang, Shredder and Super Shredder, though just like Fall of the Foot Clan, Krang serves as the final boss. The game has several difficulty settings which, depending on the level, make more powerful enemies appear or even give the bosses extra attacks." Source: Wikipedia, "Teenage_Mutant_Ninja_Turtles_II:_Back_from_the_Sewers," available under the CC-BY-SA License.